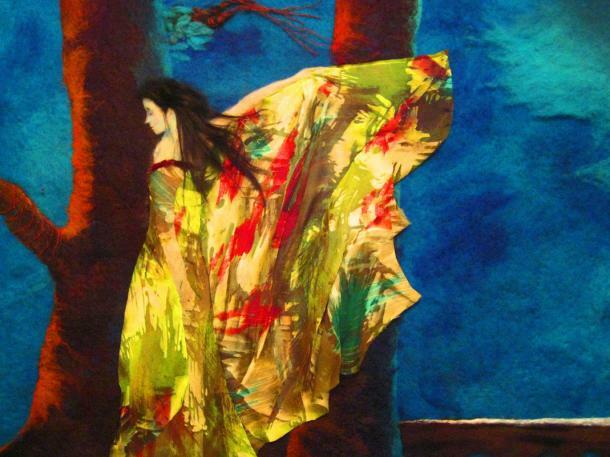 The Summer Show, the annual exhibition of work by the Devon Guild of Craftsmen membership is on at their Bovey Tracey gallery until 4th September 2016. 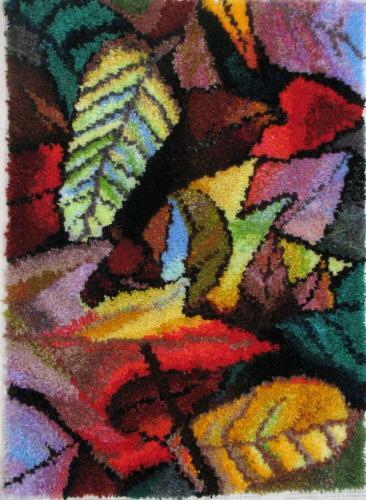 This year’s show has no specific theme and features a particularly wide range of exciting work. 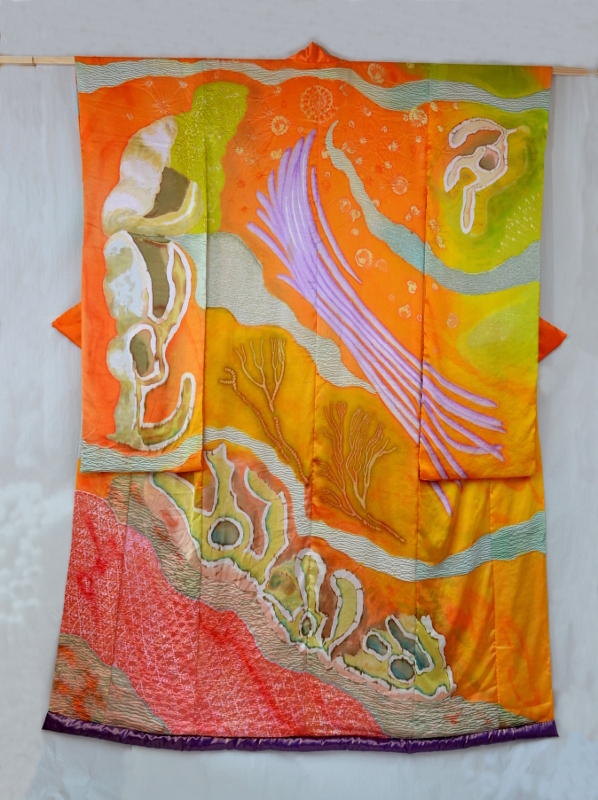 Wai-Yuk is represented by her “Taunton Kimono”. If you have the chance to be in South Devon over the next month, try to get along to see a very fine selection of the best in contemporary craft. Open seven days a week – 10.00am to 5.30pm. 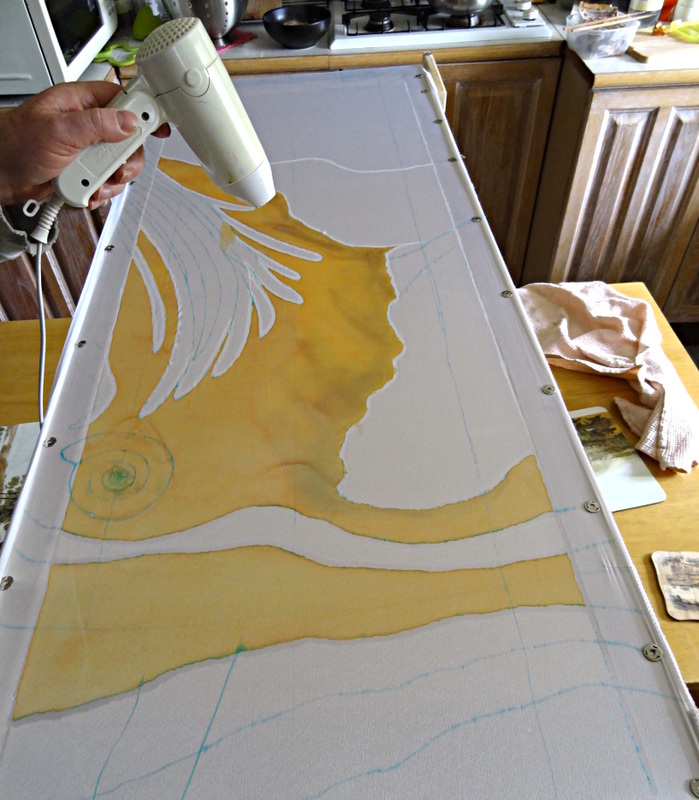 This is the second post covering the making of a silk dyed Kimono for the “Imprints” exhibition at the Museum of Somerset in Taunton. 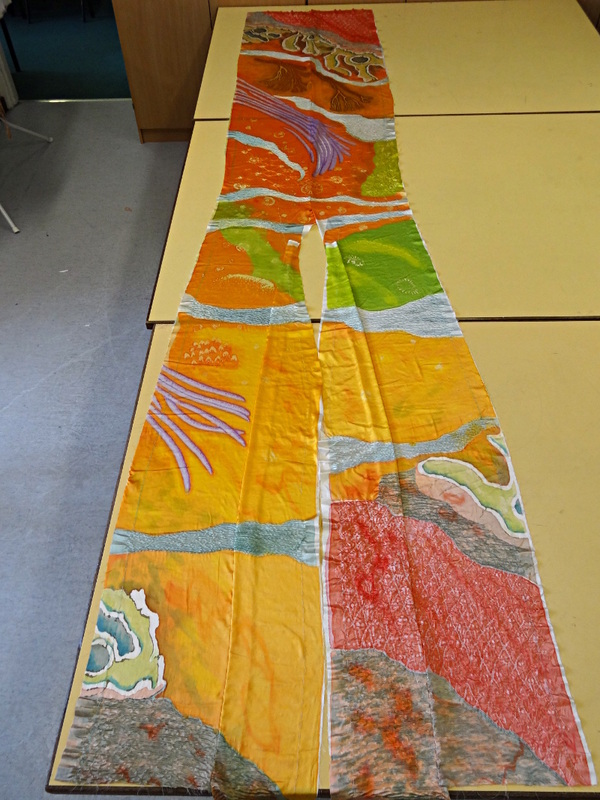 Stage two of painting the silk involved adding detail and richer colours to the design. 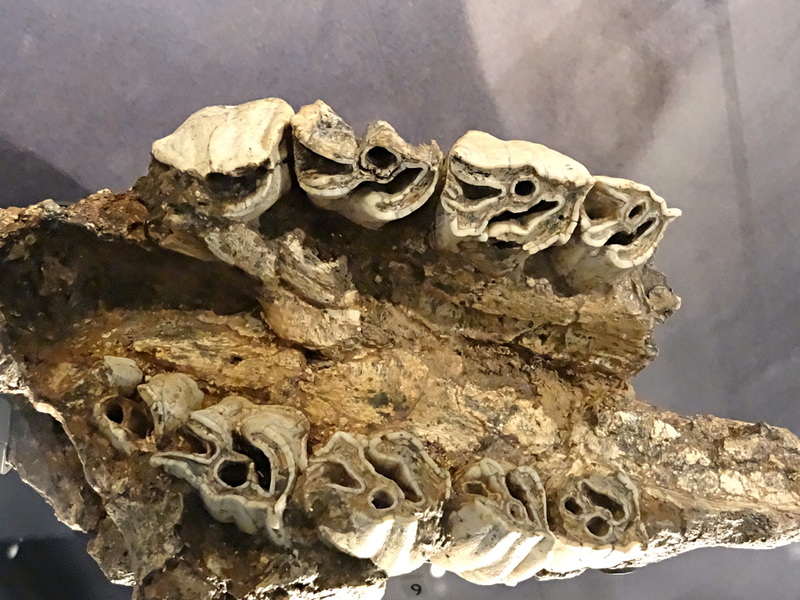 While the Rhinoceros teeth were my main inspiration, many other items in the museum fossil hall were used as inspiration for decorative details. These included ammonites, crinoids (also called sea lilies), gryphaea (devil’s toenails) and the ribs of an ichthyosaur. Some fossil cabinets had photographs of coral as a background, and these too found a place in the decorative scheme. 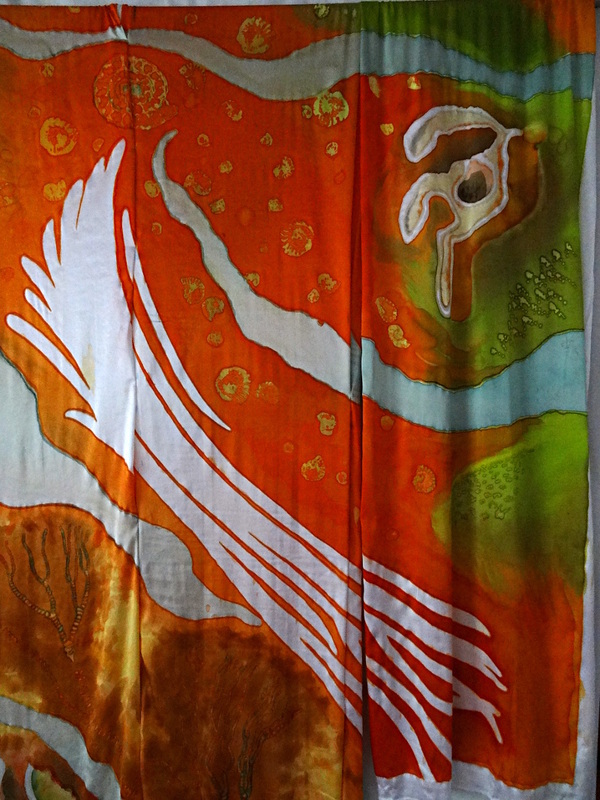 Even the colour scheme of the Kimono was originally inspired by a picture of a red desert scene on the end wall of a display. 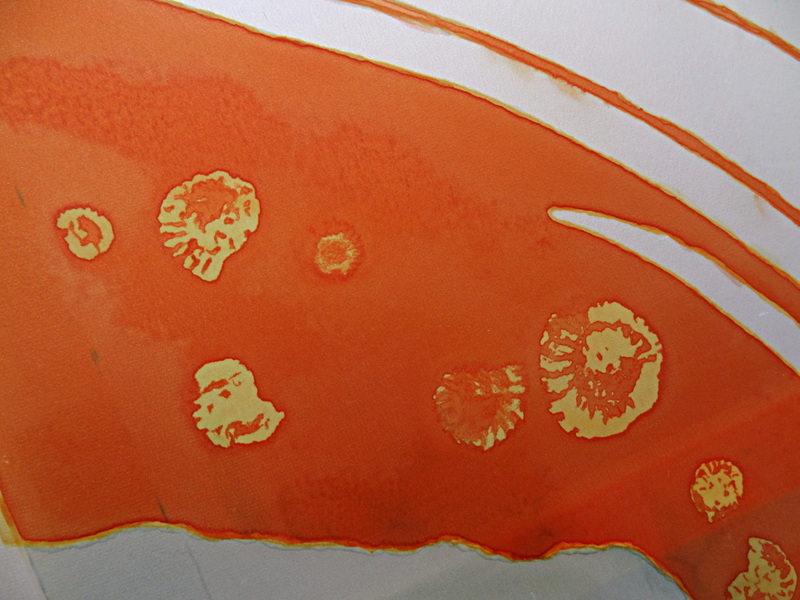 Some of the detail and colour intensity was lost in the second steaming process. 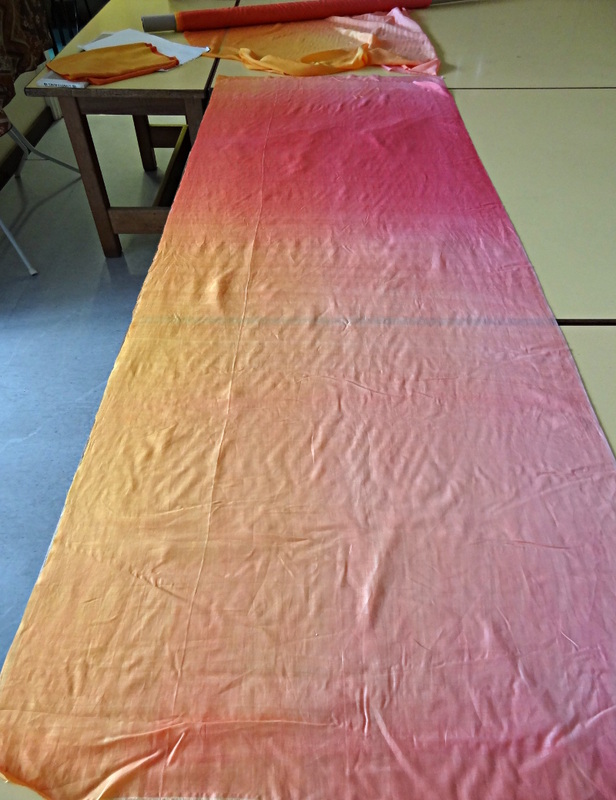 This was partly due to my unfamiliarity with the dyes, but mostly due to fact that the silk was just too lightweight to take intense dye easily. 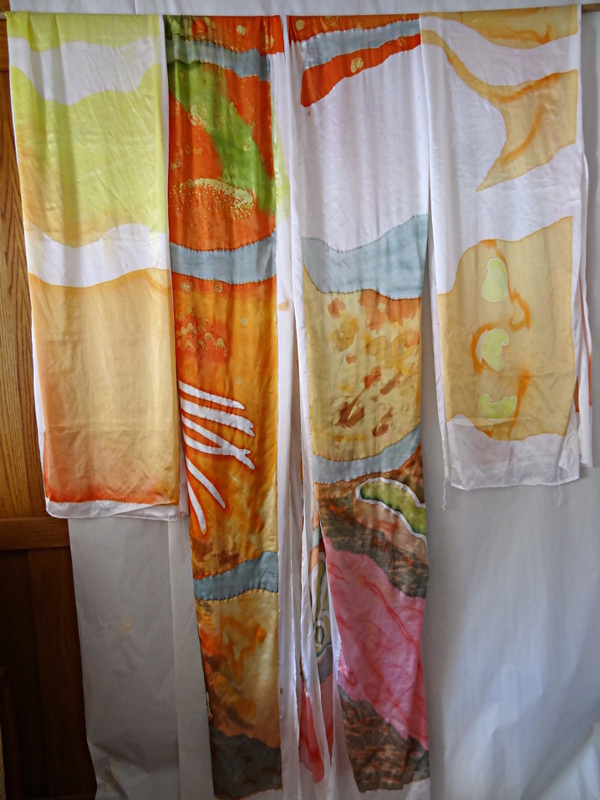 If I make another Kimono like this I will certainly use a much heavier silk. 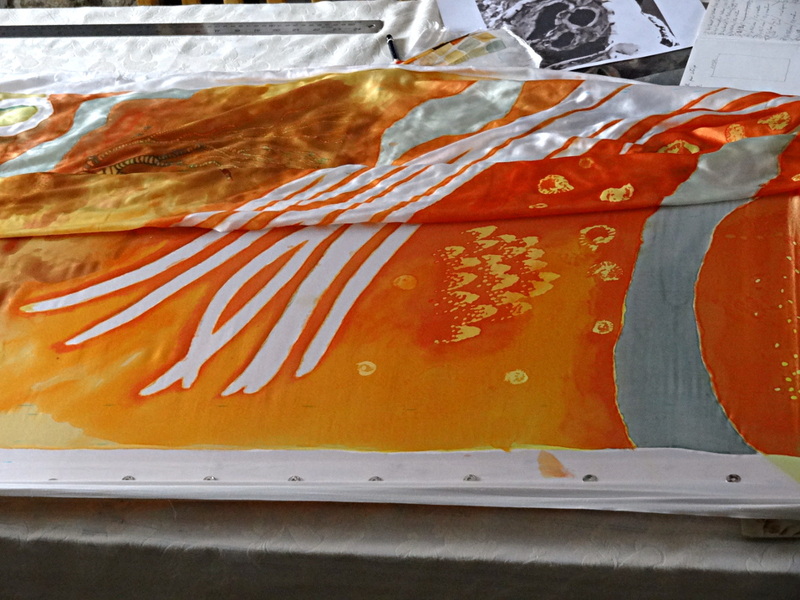 After the final steaming to fix the texture, all the Shibori threads had to be carefully removed before the Kimono could finally be assembled. 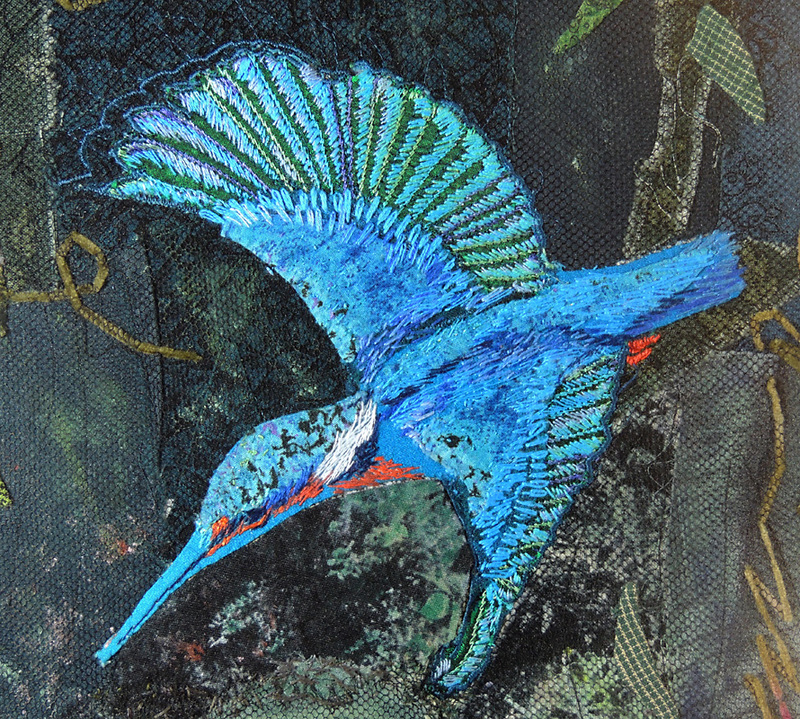 The “Imprints” exhibition is on at the Museum of Somerset, Taunton Castle, Castle Green, Taunton, from 10th October 2015 to 2nd January 2016. 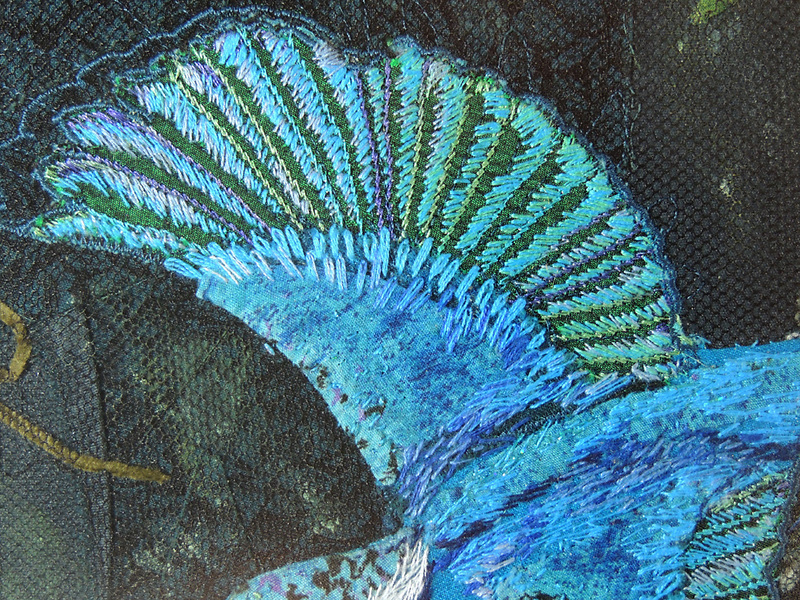 A couple of years ago The South West Textile Group arranged a future exhibition at the Museum of Somerset in Taunton. 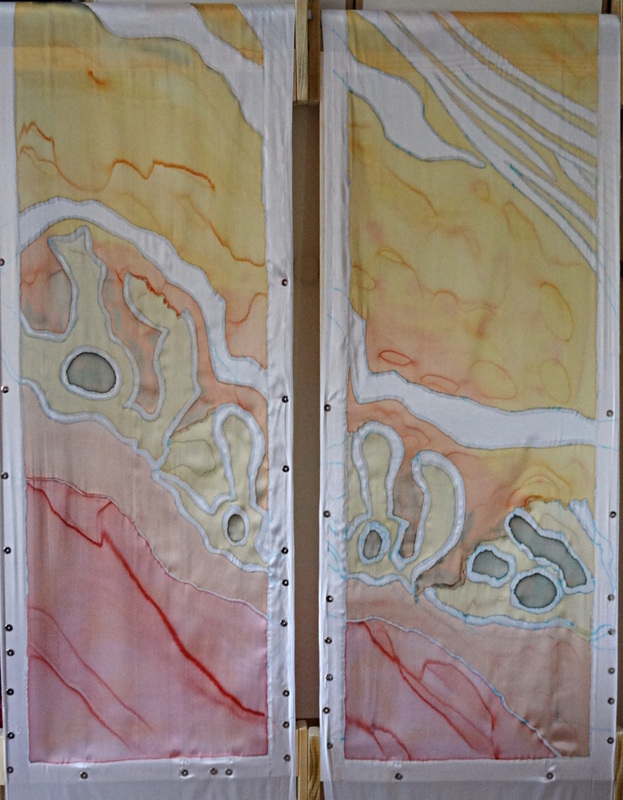 The long time scale and the chance to exhibit in a beautiful space made me decide to take on a major piece of work. I have long wanted to tackle making a Kimono and this seemed the perfect opportunity. 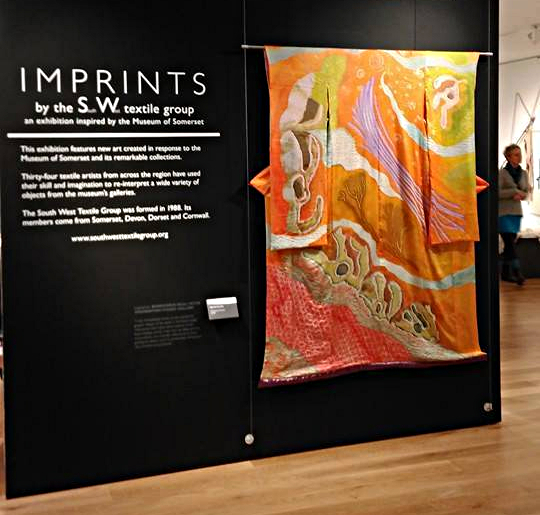 The project proved to be a long and steep learning curve, but on October 9th I got to see my piece (now known simply as “The Taunton Kimono”) on display at the private view of the “Imprints” exhibition. All the work in the exhibition was to be inspired by items or displays in the Museum of Somerset permanent collection, so a day trip to the Museum was the starting point for everyone. A tour around the collection begins with the fossil gallery. It was here that I found the objects upon which I wanted to base my design. One was a 55,000 year old fossil Woolly Rhinoceros skull which featured the most amazing teeth. The serpentine graphic shapes of these teeth just begged to be reused in a piece of art, and the fact that the skull had been dug up just a few hundred meters from the museum seemed to make it even more appropriate. 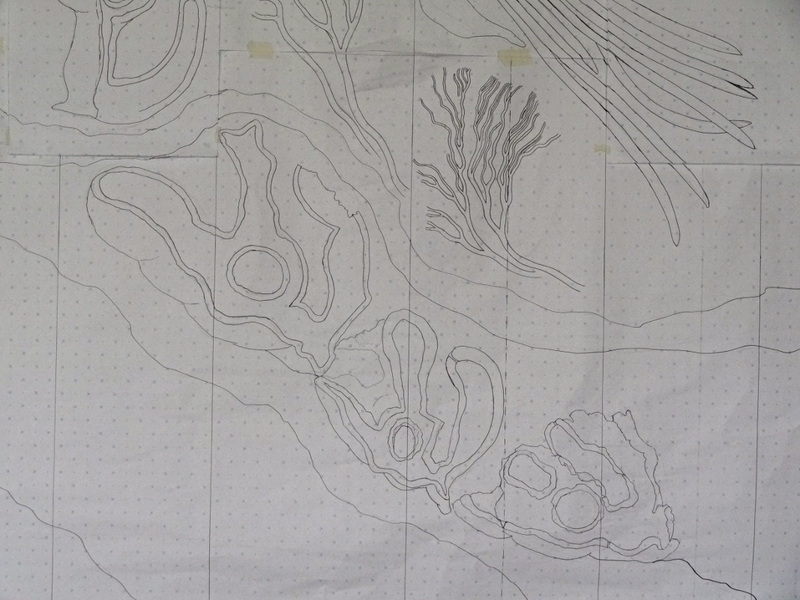 Design work began with sketches based on photographs taken at the museum. (In the end I almost filled a couple of sketchbooks with ideas big and small.) 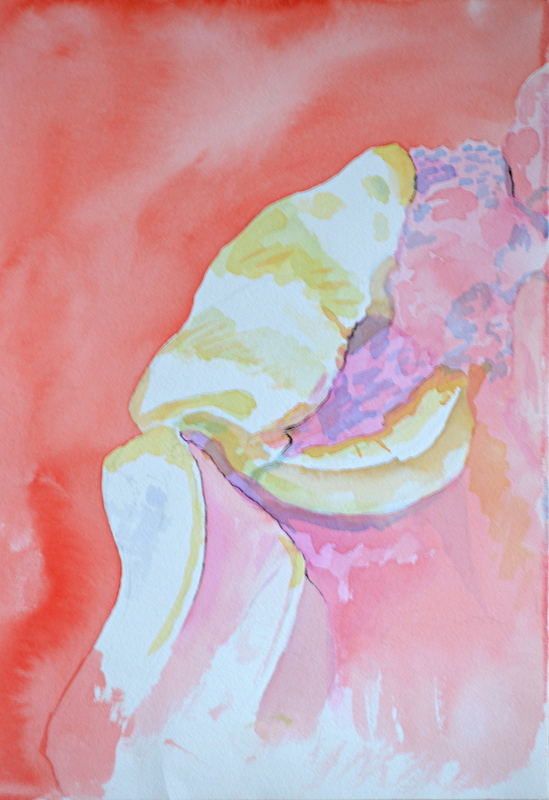 These led on to a large number of watercolour sketches where I began to get an idea of the colour scheme I wanted to explore. 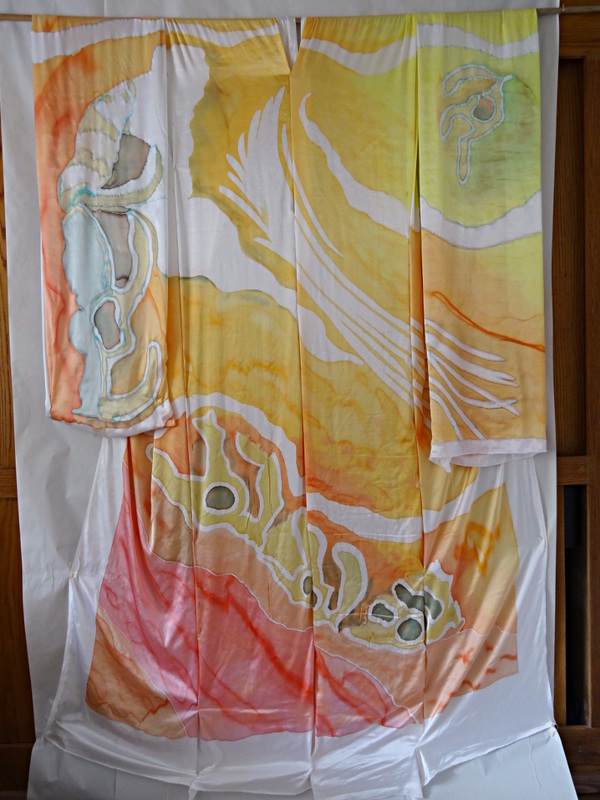 Watercolour sketch exploring ideas for the Kimono design. 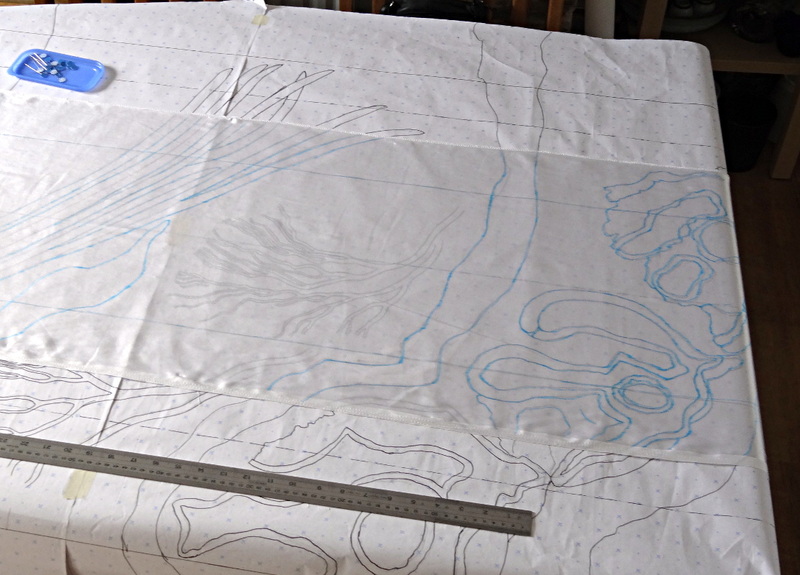 Work on the Kimono itself started with a full-sized line drawing that was then transferred on to the silk. 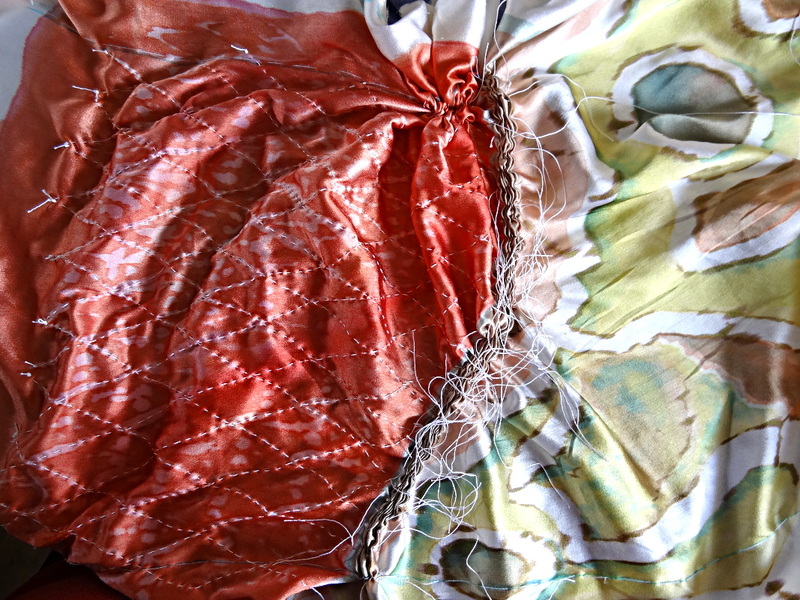 I had originally planned to use exclusively Shibori techniques to decorate the fabric, but the silk I had was too lightweight and too prone to bleed along the satin fibres to be reliably dyed using these methods. 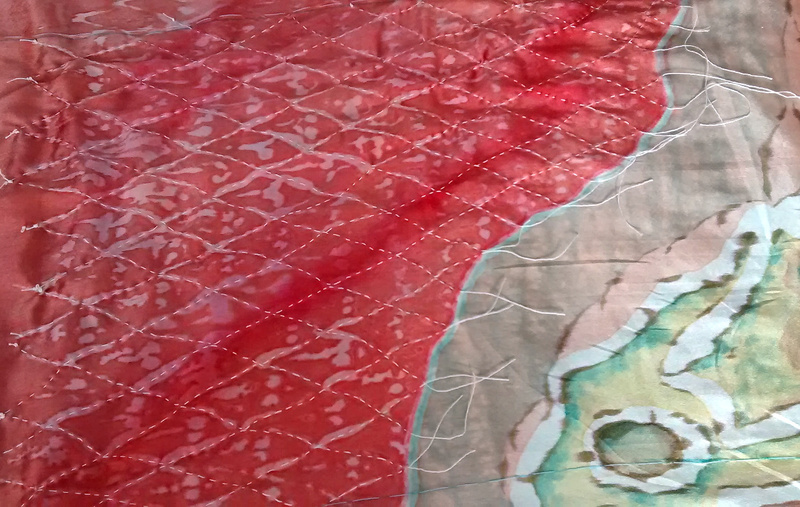 I therefore resorted to conventional silk-painting techniques and used Shibori purely for texturing. My husband Alex was heavily involved in the project throughout. 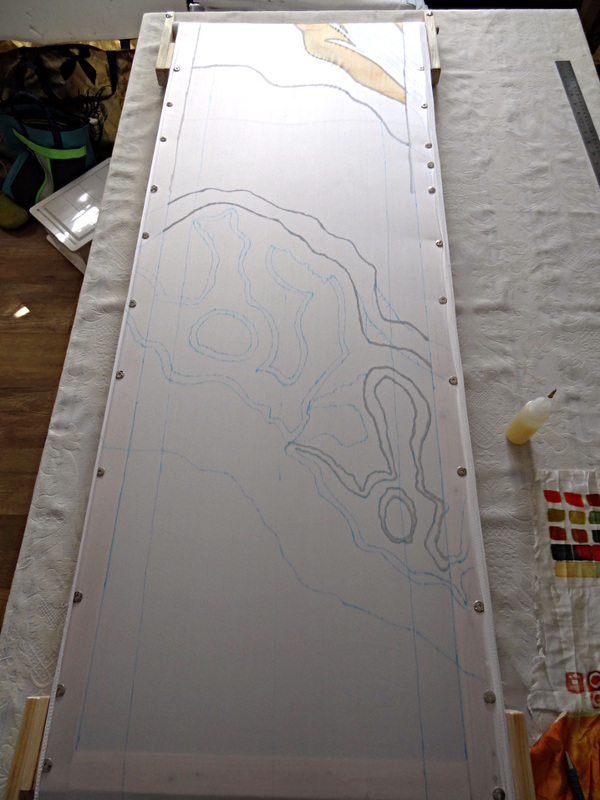 As well as helping with both the design and execution, he also made the painting frames with rollers on each end to cope with the long fabric lengths. His other great contribution was in making a really good steamer to fix the colours. 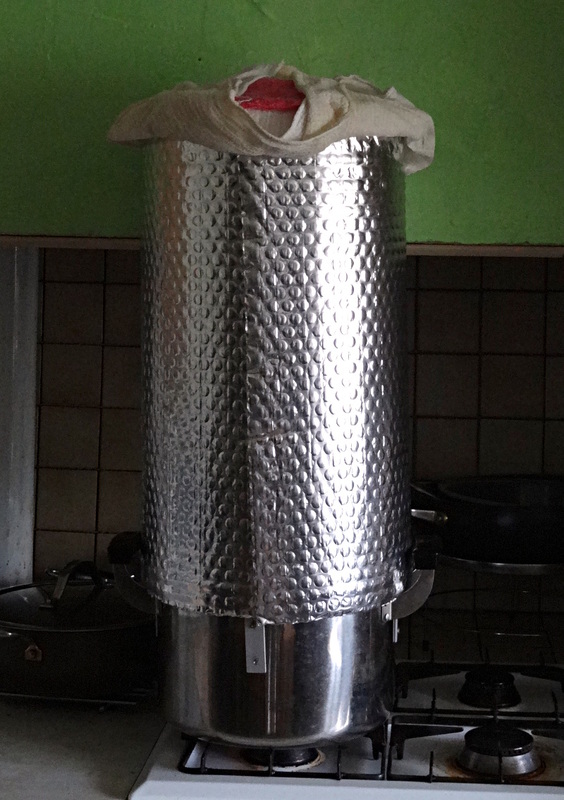 He simply fixed an aluminium tube to the top of a large saucepan, with a hollow tube suspended down the centre around which the silk was rolled. 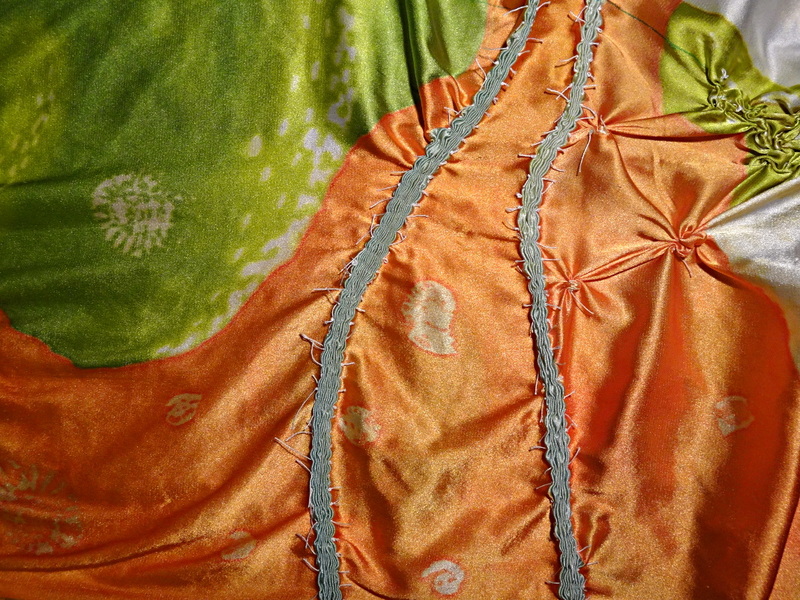 My next post will cover the remaining part of the Kimono making process. 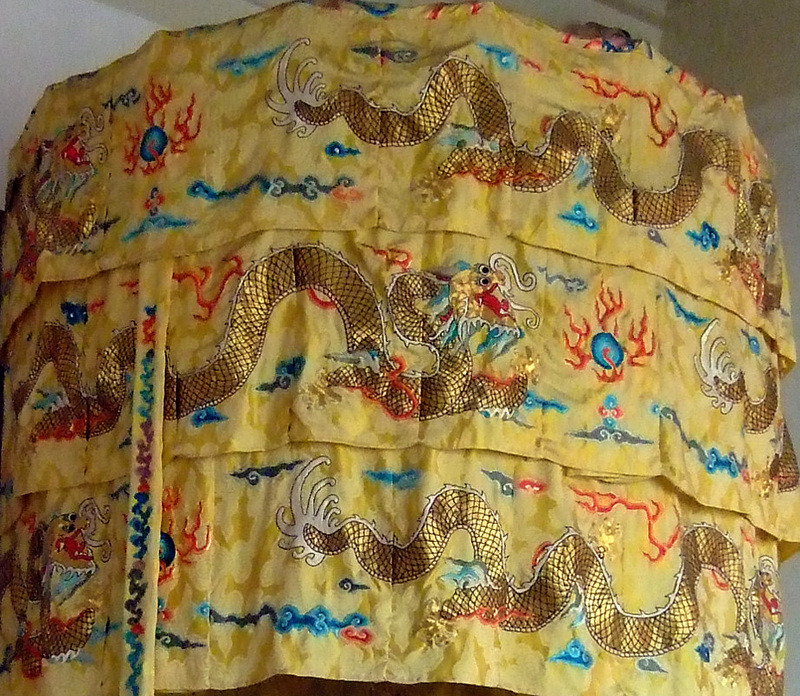 I love Chinese dragons! Unlike the fearsome dragons in the West, which must be battled and slain, the Chinese versions are, if not friendly, at least not threatening. 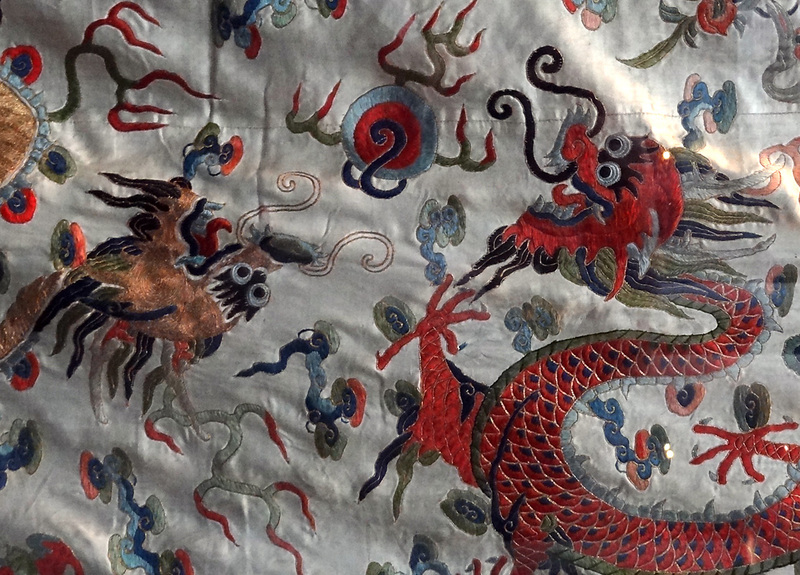 Here a few representations of Chinese dragons in embroidery. Most of the dragons here are imperial dragons, symbols of the Emperor himself. 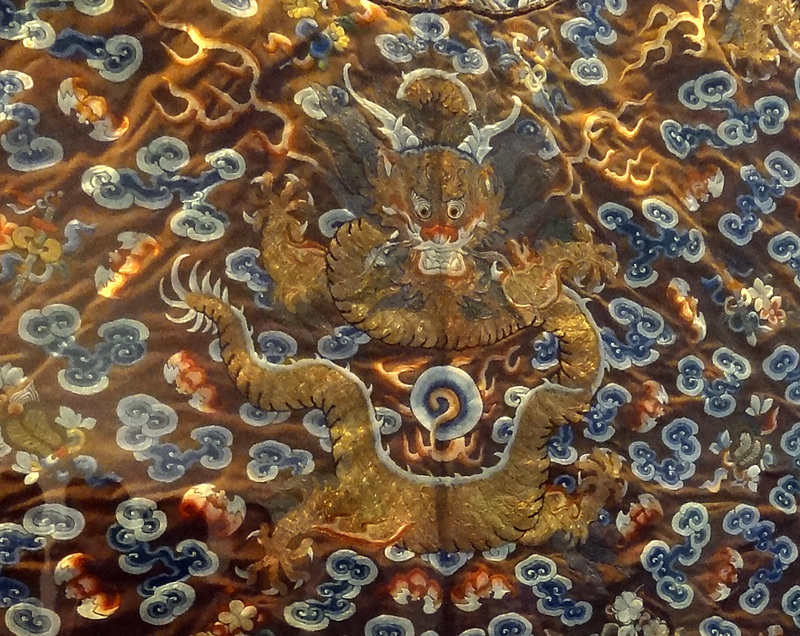 During the final Chinese dynasty, the Qing period from 1644 to 1911, the dragon could be found on almost every piece of Imperial clothing and regalia. This may have been due to the foreign Manchu rulers feeling that they had to constantly assert their legitimacy by using this very Chinese symbol of rule. 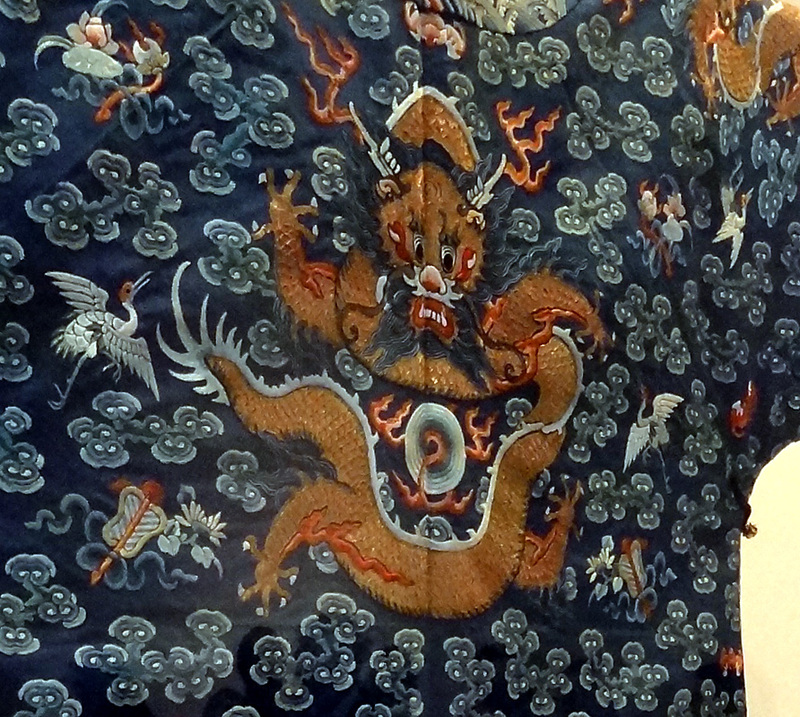 Many of these textile pieces are Imperial clothing and accoutrements from the V&A museum and the Forbidden City in Beijing. While these dragons vary in colour there is a sameness running through them as if the makers were very careful that the forms and expressions of their creatures matched the required type. Other dragons that are not from the Imperial household are much more varied, often with wonderful, mad expressions as they manically chase their flaming pearls. 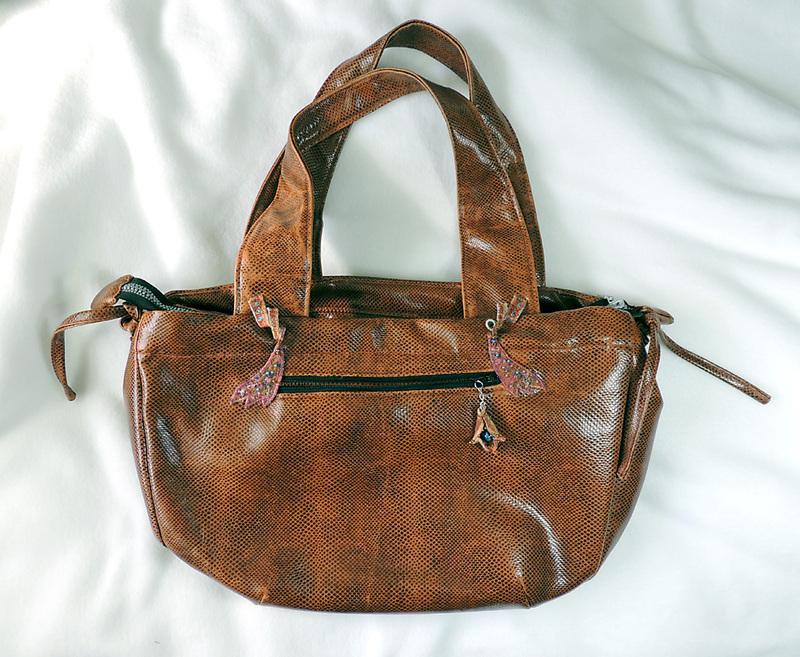 My daughter Isla said she needed a new large-sized bag to hold all her things when she went to work. When I hear something like this of course, I think about creating something, rather than a trip to the shops. 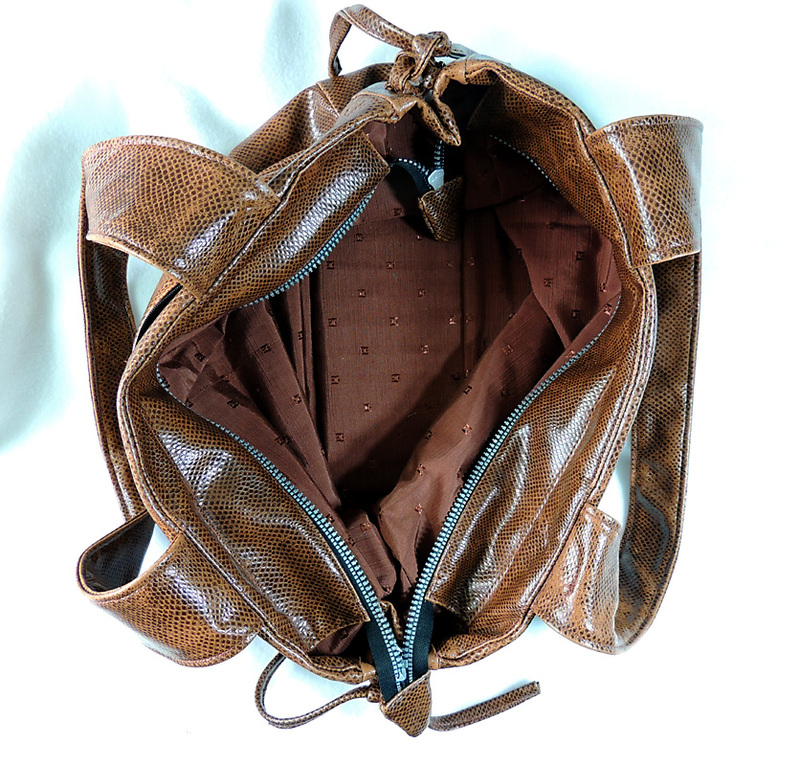 I had a large piece of artificial snake-skin leather material that was looking for a role in life, so I set to work and produced this big chunky item with lots of inside pockets and a strong zip to keep everything secure. 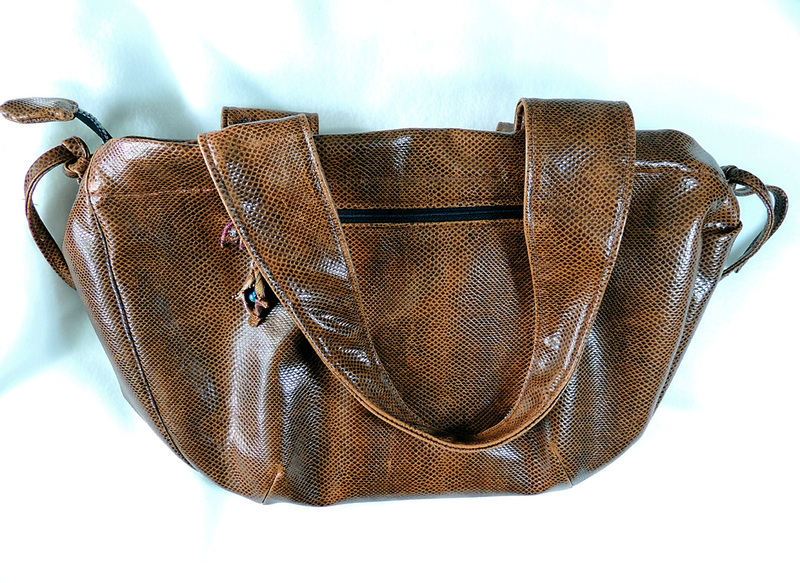 I am not sure if this style is in line with current fashions but Isla will have a good practical bag with a unique design. The size of the body is approximately 30mm X 46mm (12″ X 18″). I could not resist adding a few signature touches of decoration! That is one more enjoyable project completed using only materials I had at home. Though it meant a day or so without getting any jewellery work done, I think it was well worth the time spent and its at least part of a birthday present problem sorted out! 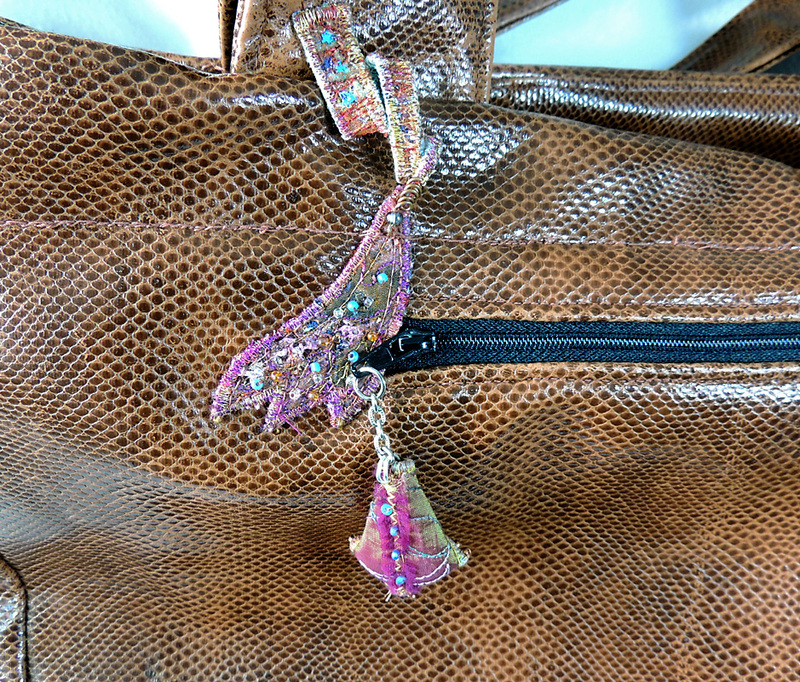 One-off items are such fun to make! 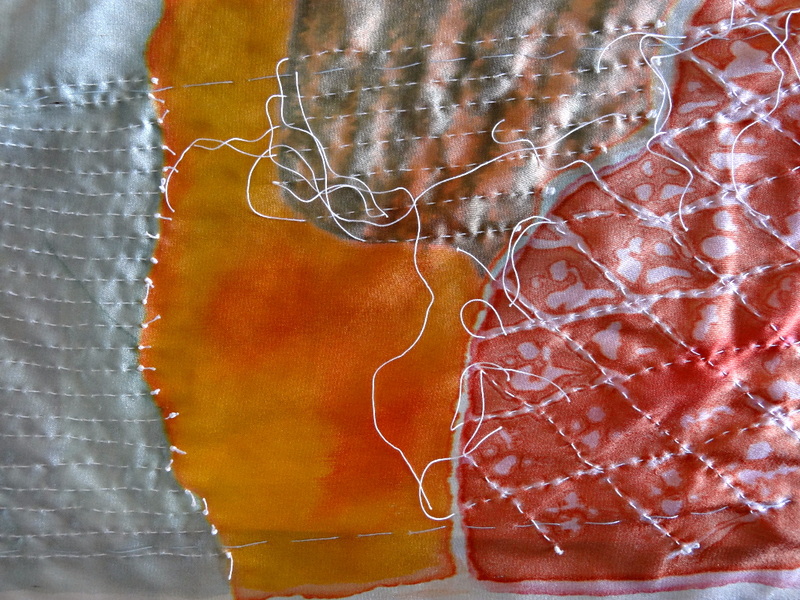 Related Post: Some Textile Work as a Break from Making Textiles! 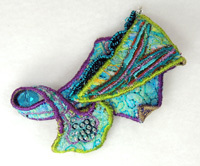 A lot of my work used to feature hand embroidery. 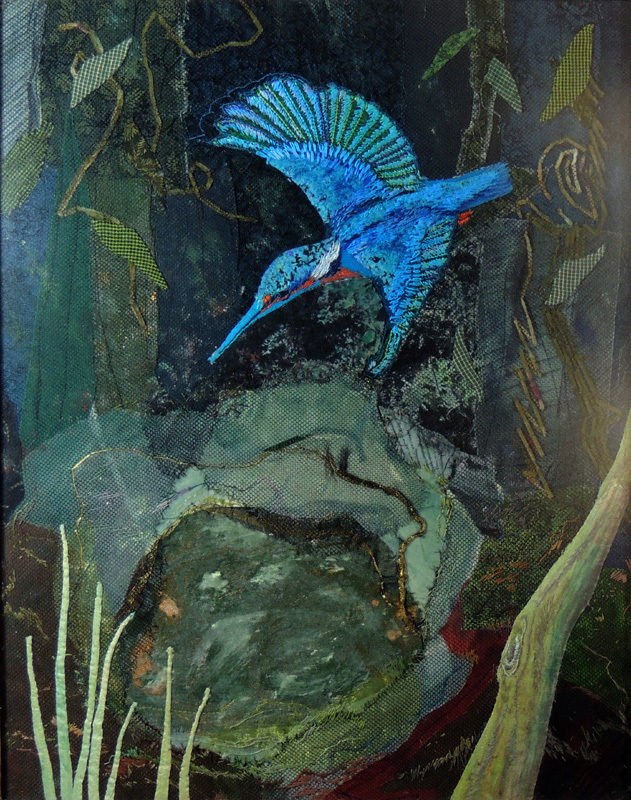 The picture I am featuring here is a fabric collage of a woodland scene, complete with a hand-embroidered kingfisher, that I completed several years ago. I must apologise for the photographs not being as good as they should be. 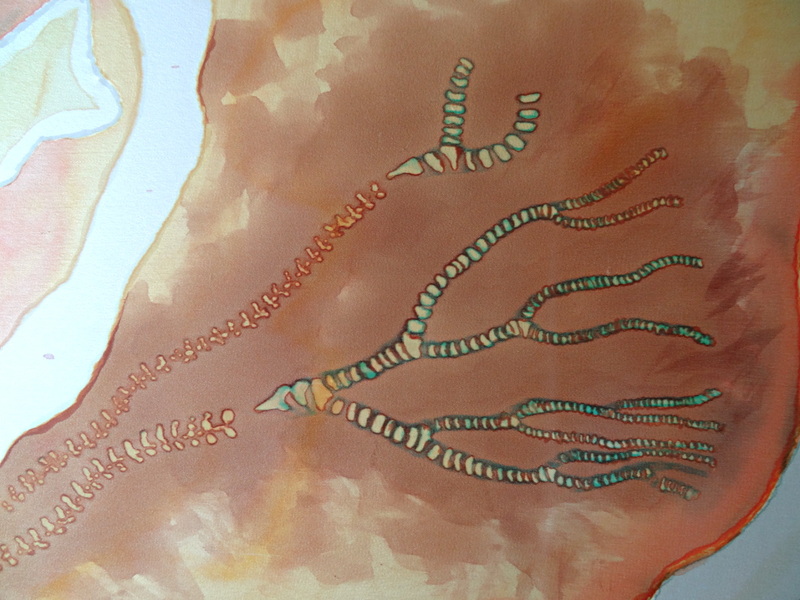 Unfortunately, I used lots of rather coarse mesh to adjust large areas of the background which looks OK in real life but refuses to photograph well. The camera seems to be able to “see through” the mesh without registering the change in tone that eyes do. 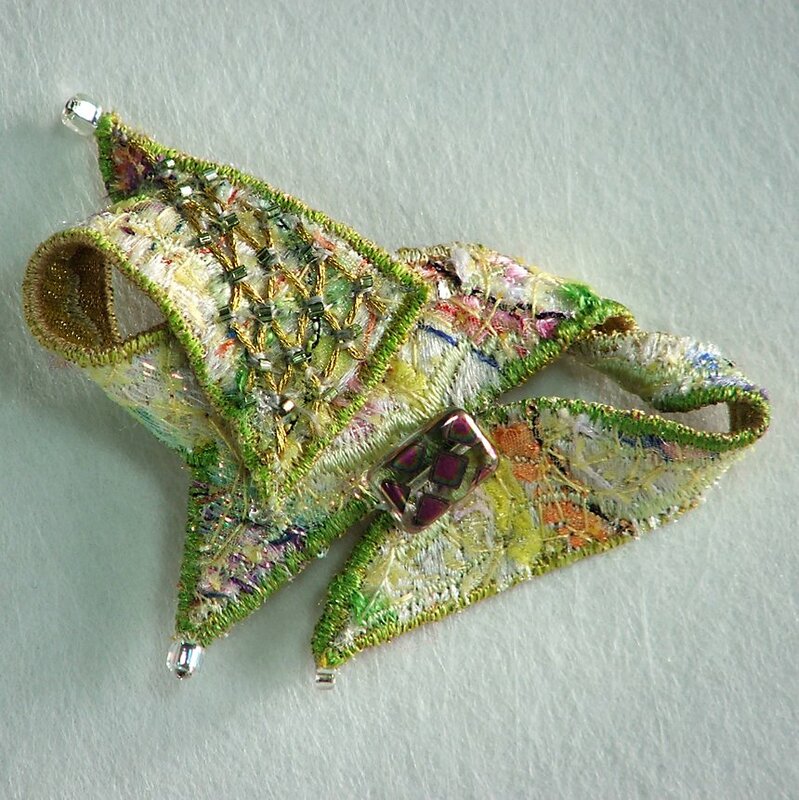 I recently became a member of the Textile and Fiber Art list. 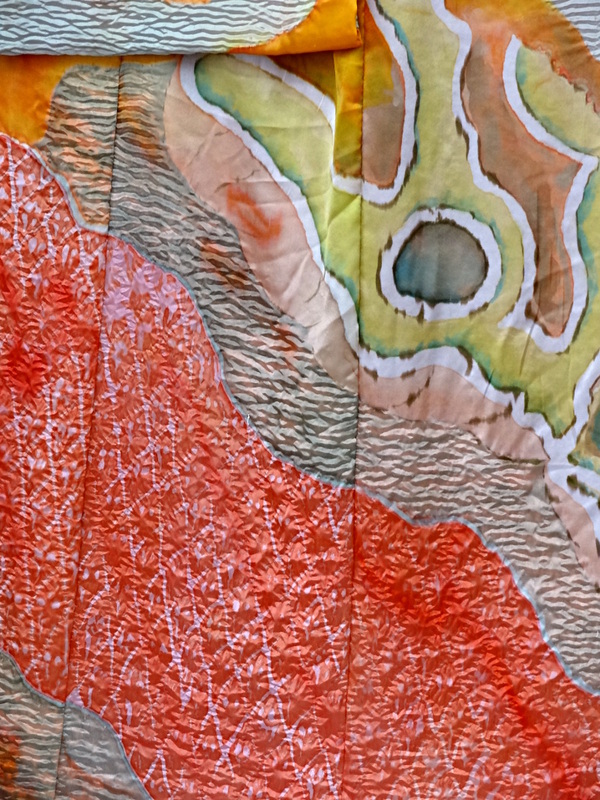 This is a fairly young but very impressive organization dedicated to helping textile artists access the power of the web by working collectively. TAFA now has over 400 members from 35 countries. Each member has their individual profile page on the TAFA website, which is based on the idea of linking all the various presences an individual has on the web in on place. 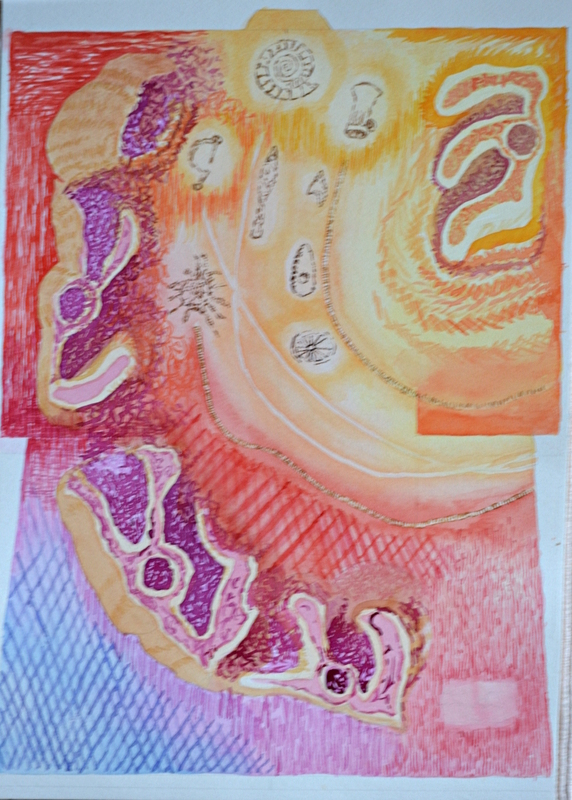 The images here are just a tiny glimpse of the work to be found on TAFA. By going to my profile on TAFA, you can see the work currently for sale in my Etsy shop, view my Flickr slideshow, check out my location on a world map and access direct links to my Facebook, Etsy, Twitter, Flickr and Tumblr accounts, plus my website and this blog. It is a very well thought out solution which must be a great model that many other organizations could follow. 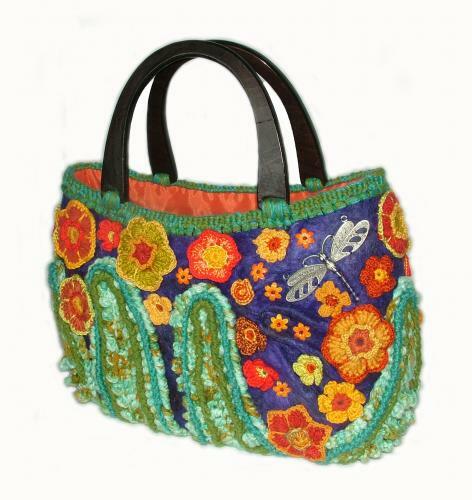 In addition to the main website, TAFA also has a presence on Facebook, etc., as well as running an Etsy group. The driving force behind TAFA is its founder Rachel Biel who supplied a great deal of assistance in getting me up and running on the site. Rachel is a great believer in the power that comes from people working together and has clearly put in a great effort to make her vision a reality. As well as trying to build a successful business model for individual craftspeople, the organization also pays a lot of attention to issues such as fair trade, sustainability and the environment.